This phase concentrated on the town of Schmidt, astride an important German supply route, within the southern part of the forest. 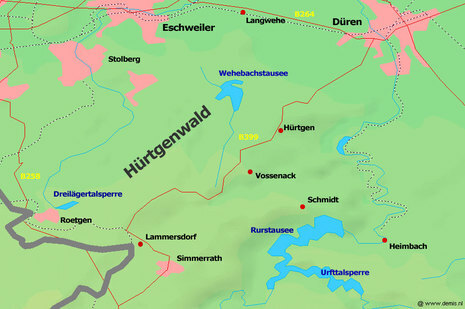 The engagement began on September 19, 1944, with a probe by the U.S. 60th Infantry Regiment that entered the Hürtgen Forest but was beaten back by the terrain and opposition. On October 5, the U.S. 9th Infantry Division attacked the town of Schmidt using the 60th and 39th Infantry Regiments while the 47th held a defensive position. 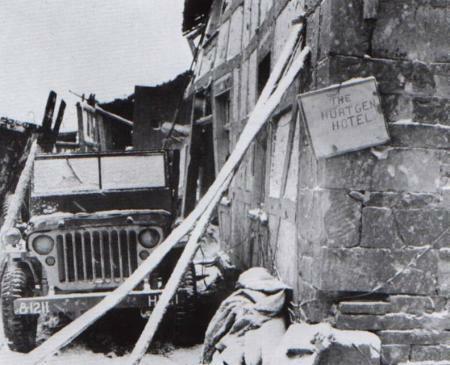 The Monschau–Düren road was quickly cut, but both regiments were slowed by defenses and suffered significant casualties: the 60th’s 2nd battalion was reduced to a third after the first day. The 39th was halted at the Weisser Weh Creek; there were problems with narrow paths, air bursts in trees, and fire breaks which were blocked or enfiladed. Evacuation and supply was difficult or impossible. The slogging match continued. By October 16, 3,000 yards had been gained at the cost of 4,500 casualties. The U.S. 28th Infantry Division, a Pennsylvania National Guard unit, arrived on October 16 to relieve the battered 9th. The 28th Division was reinforced with armor, tracked transport Weasels and air support. Of its three regiments, one was deployed to protect the northern flank, another to attack Germeter, and the third to capture Schmidt, the main objective. The area had terrible terrain with the Kall Trail running along a deep river ravine. This was not tank country, despite the need for armor to support the infantry. A track from a U.S. armored vehicle that was hit and burned in the Kall Valley. The track section has melted into the road. The attack by 28th Division started on November 2; the defenders were expecting it and were ready. The U.S. 109th Infantry Regiment was impeded after 300 yards by an unexpected minefield, pinned down by mortar and artillery fire and harassed by local counterattacks. One mile was gained after two days, after which the 109th dug in and endured casualties. The U.S. 112th Infantry Regiment attacked Vossenack and the neighboring ridge, which were captured on November 2. The 112th was then halted on the Kall by strong defenses and difficult terrain. The U.S. 110th Infantry Regiment had to clear the woods next to the River Kall, capture Simonskall, and maintain a supply route for the advance on Schmidt; again these were very difficult tasks due to weather, prepared defenses, determined defenders, and terrain. The weather prevented tactical air support until November 5. 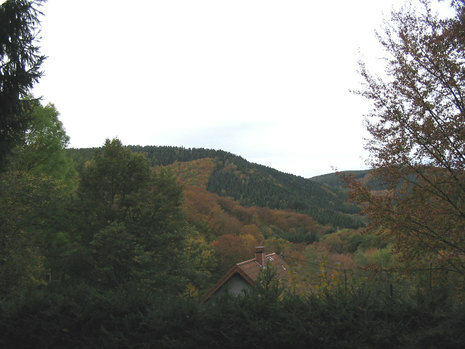 The 112th captured Schmidt on November 3, cutting the German supply route to Monschau, but no American supply, reinforcement or evacuation was possible, as the Kall Trail was blocked. A strong German counterattack by tanks of 116th Panzer Division and infantry from 89th Division rapidly expelled the Americans from Schmidt, and they were unable to counterattack. For two days, the 112th remained hard pressed to hold its positions outside Schmidt. Across the Kall Bridge the troops of the 28th US Infantry Division pushed forward at the beginning of November 1944 to capture the village of Schmidt. After a few days, the so-called Allerseelenschlacht (All Souls Battle) resulted in a disaster for the Americans. As American troops tried to retreat across this bridge to Vossenack, great parts of the Kall Valley were already cut off by the Germans. A German regimental doctor, Captain Guenther Stuettgen, managed to negotiate an unofficial ceasefire with the Americans at the Kall Bridge from November 7 to 12, in order to attend to the wounded of both sides. The lives of many American soldiers were saved by German paramedics. At Vossenack, the 2nd battalion of the 112th disintegrated after constant shelling and fled a German attack. Following the providential arrival of two U.S. armored platoons of tanks and M10 Wolverine tank destroyers, supported by those 2nd battalion men who had held tight, and two companies of 146th Engineers operating as infantry, the Americans held on and the fighting for Schmidt continued until November 10.